Sweet Auburn Curb Market turns ninety this year. 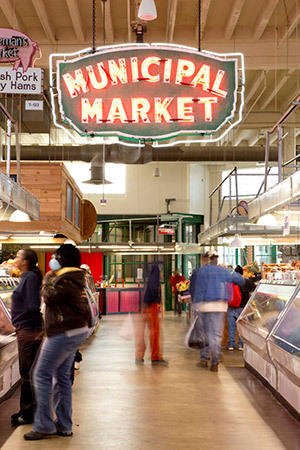 Originally known as the Municipal Market of Atlanta, it began as an assembly of open-air vendors on land laid waste by the Great Atlanta Fire of 1917, which started near a Decatur Street warehouse and consumed almost 2,000 buildings. The Atlanta Woman’s Club raised the money for a permanent structure, which opened in 1924. It thrived until the 1960s, when interstate construction bisected the Sweet Auburn neighborhood and the suburbs began luring residents from Downtown. The market was renovated in the early 1990s as part of Olympics fever, and then felt the brunt of the tornado that ripped through the area in 2008. Despite some crippling swings of fortune, the market now has a promising new role in the community—as a small-business incubator. You can still shop for collards and oxtails and crawfish, but the dining options have never been better. When Pam Joiner arrived from Savannah to manage the market’s operations in 2005, there were nine vacant spots among the service counters. Even though the city, which owns the market, desperately needed rent funds to keep the place functioning, Joiner insisted that she would accept only singular tenants capable of attracting new customers. And last year the market hired Gene Kansas Commercial Real Estate, a company also involved in revitalizing the nearby Atlanta Daily World building that was badly damaged by the 2008 tornado, to help mastermind leasing and marketing. Grindhouse Killer Burgers and Bell Street Burritos, two of the first new businesses under Joiner, drew more epicurean crowds to the building, and both have since expanded to freestanding restaurants around the city. The latest crop of vendors brings much-needed ethnic and health-minded diversity to the scene. Their timing is excellent: When the Atlanta Streetcar Project launches in early summer, the market will be one of the stops.